"Someone told me during pregnancy that I did not need to worry so much about reading baby books as the baby will tell me what she needs. I didn't understand it before but it makes perfect sense now. Hopefully other new parents can feel confident that their baby will signal (in their own way) whether they are tired or hungry or want a change in surrounding, etc. One only needs to spend time paying close attention to his or her baby...this precious time together is the best part of the job!" I met today's mommy at my very first library story time. I was immediately impressed with the research and thought she puts in the important decisions, and the intuition she uses for the every day care of her baby. It may have taken a journey of twists and turns to reach parenthood, it only made her all the more prepared and loving! Nicole is super informed when it comes to safety, and her vigilance shows in Becca's calm and happy nature. 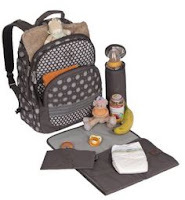 This mommy-baby duo is always up for a trip to the park or a nice lunch, so the diaper bag must be stocked well. Let's take a peek into this cool city mom's diaper bag. Basic Save: Diaper disposal bags. A mom gave me the tip to get dog poop bags from the dollar store, way cheaper than baby labelled bags. Essential Splurge: Diaper bag backpack. This was my third diaper bag (the other two were gifts, standard style). The backpack style frees up my hands as it feels as if I would be better as an octopus with all the things to carry at times. Although any backpack would do, the baby specialty ones have the insulated bottle holder and multiple pockets that seem indispensable. Great tip! Make sure you look for a back pack style diaper bag with good structure, comfortable padded shoulder straps, and ample pockets. Best Preparedness Advice: I like to pack my bottles pre-filled with sterilized water so the process is quicker to minimize meltdowns (baby and mine). I also pack one extra bottle beyond what I need, to be prepared for extended outings. In terms of day-to-day management as a mom, I prefer to keep her day routine flexible so outings do not need to revolve strictly around her schedule. Final Words of Wisdom: Flexibility seems to be key in parenthood with rigour where it matters the most. E.g. From early on, I had the baby used to room temperature milk to make future outings easier. Also, I ensured lights and reasonable noise during naps which differed from the darkness and quietness of night. Contents: Wipes, disposable change pad, reusable change pad, disposal bags, wash cloth (for drying bums to avoid diaper rash), bottle (with sterilized water), powder formula, two bibs, receiving blanket, change of clothes, toy/pacifier wipes. Missing, but usually present: A favourite toy!